Cozy cottage in a rural location with a beautiful outdoor area. Good excellent trails immerse you deeply into the Norwegian nature. Charming rorbu at Hellesøy, a small island paradise outside Karmøy. The rorbu is located to its own and offers beautiful views to several islands and islets. Welcome to this charming holiday home at Karmøy. The holiday home is situated only 300 meters from the fjord. From the house you have beautiful view of the fjord and the surroundings. This high-quality holiday home well-situated with a fantastic view of the ocean and skerries. Welcome to this spacious, nice and new holiday house with a peaceful location 300 metres from the fjord. Panorama view of the sea, mountains and forest from the terrace. Tastefully furnished house directly by the sea with panoramic views over Åkrehamn. This charming log cabin boasts a traditional design and a wonderful terrace area, complete with breathtaking view. 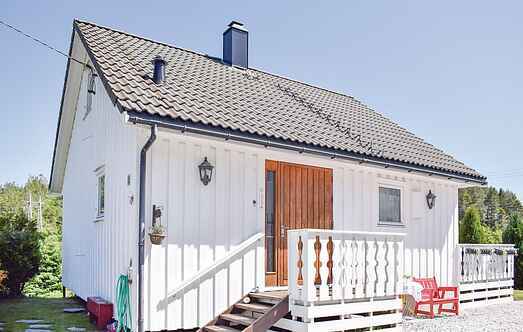 This holiday home is situated in a beautiful and peaceful location overlooking the fjord and the mountains. It has a terrace and an outdoor area with garden furniture and a barbecue. Holiday home with a big terrace in rural surroundings. The house is located close by the sea and Skjølingstadvågen is not far away either. Cozy cottage in a rural setting. The cottage is in a wooded area attached to a farm. It has a nice view over the hilly terrain with lake and further out to the open sea.